"How do you know you don't like it if you haven't tried it?" 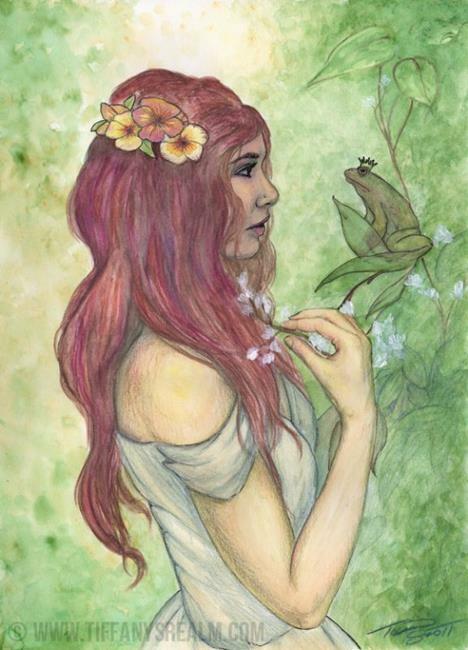 The whole frog-prince thing was at its height, and every common frog was running around with a crown on his head hoping for a kiss from some poor, foolish maiden. Eventually all those girls realized what was going on, and now the real frog prince can't get anybody to give him a kiss. He'll try anything, any corny pick-up line, just in case he's finally met a gullible maiden. This original painting is 10"x14" on hot press watercolor paper. It's a mixture of watercolor, watercolor pencils, acrylic, colored pencils, and Micron ink.